I actually had so much fun up-cycling the thrift shop Home Interiors Wood Books, that I decided to up-cycle a couple of real thrift shop books. The one on the left is an unused military type record book. It was stained but never used. These books are still available online but I purchased mine for 50 cents. I love the fabric cover. The other book was "Mind Your Manners" a 1964 etiquette book by Betty Allen, for 99 cents. I took the jacket off the manners book, and it had a fabric cover as well. My first step was to paint both books with Dutch Boy Chalky Finish Paint in True Black. 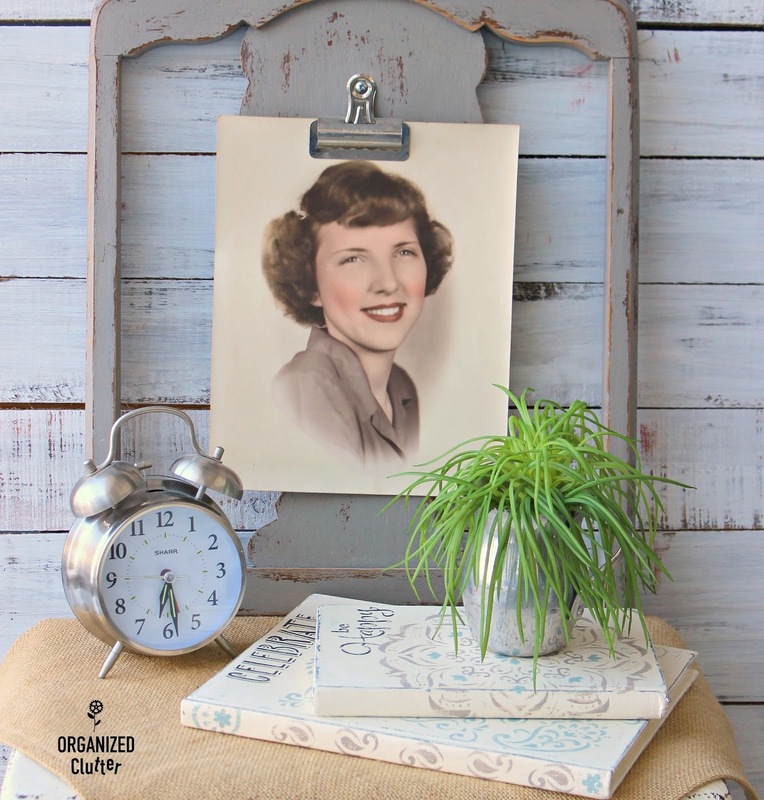 I love the color but I have moved to Rustoleum Chalked Paint for my knock off chalk paint selections. I painted all four sides, page edges and all. Next, I painted over the True Black with two coats of Chalked Paint in Chiffon Cream . I used a FolkArt Paisley Delight stencil on the cover and spine of the larger book. 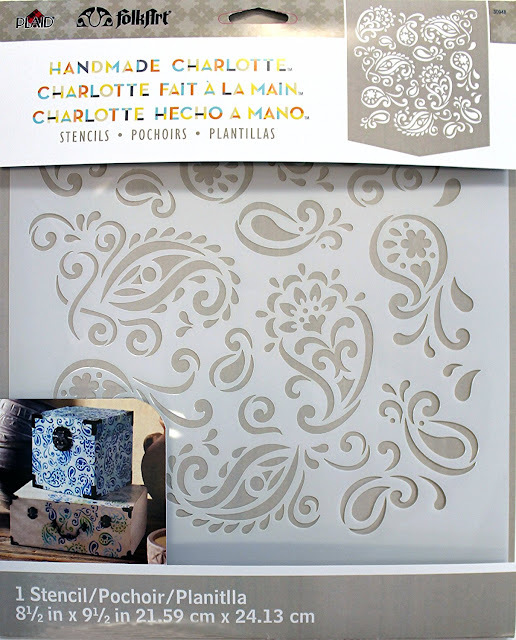 I taped the stencil down with blue painter's tape. 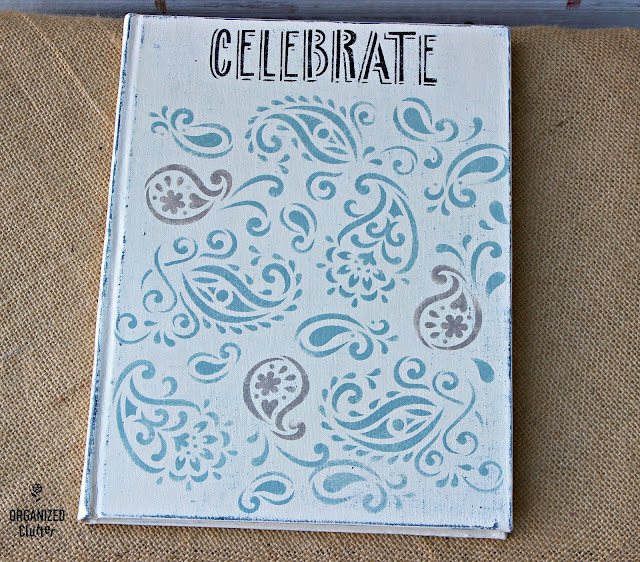 I stenciled the book cover paisley stencil with both Annie Sloan Chalk Paint in French Linen and Duck Egg Blue. 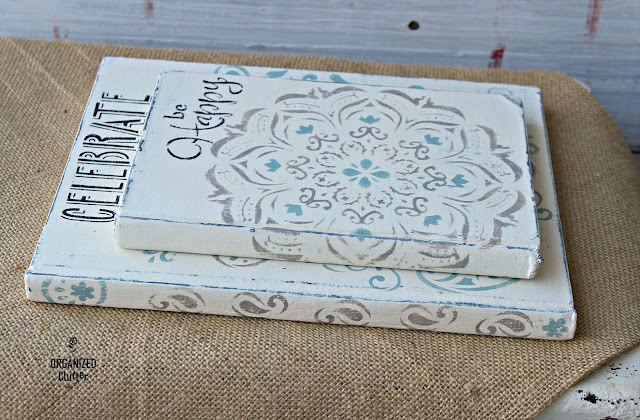 The smallest paisley designs were stenciled on the book spine. Both books were sanded with 220 grit sandpaper with more pressure on the edges and less pressure on book cover centers. The sanding smooths the brush strokes and exposes the black undercoat on the edges. I pulled out my much used Hobby Lobby Mandala stencil. 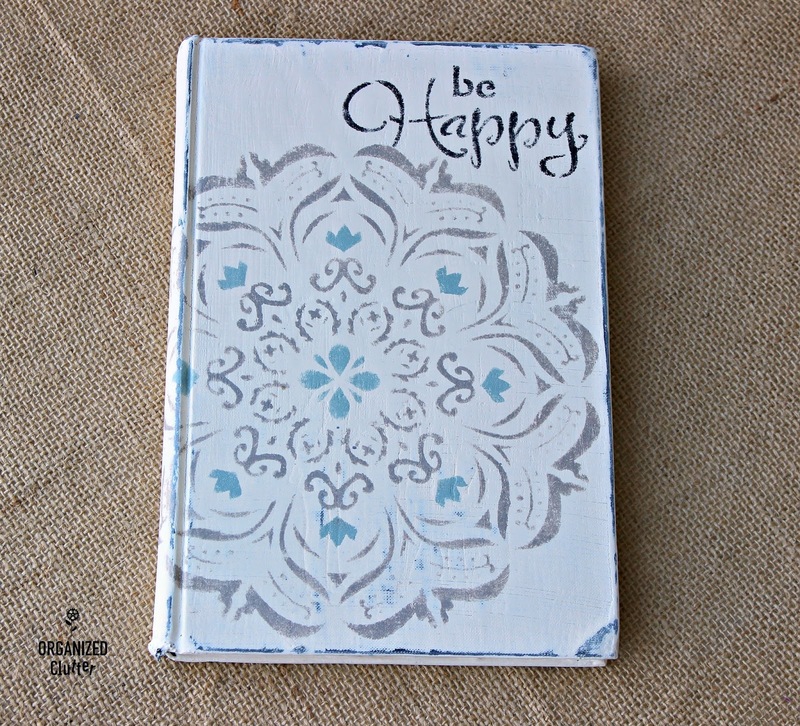 After taping it on the smaller book, I stenciled the mandala stencil with ASCP in French Linen and Duck Egg Blue. 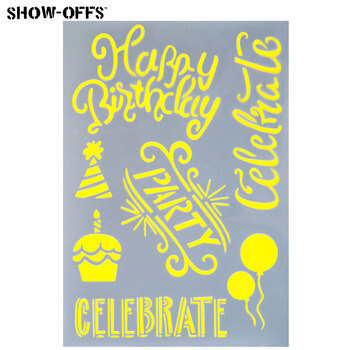 I added the bottom "Celebrate" stencil from this Hobby Lobby birthday stencil as the title of my book with black Ceramcoat craft paint. This is the makeover of the larger record book. 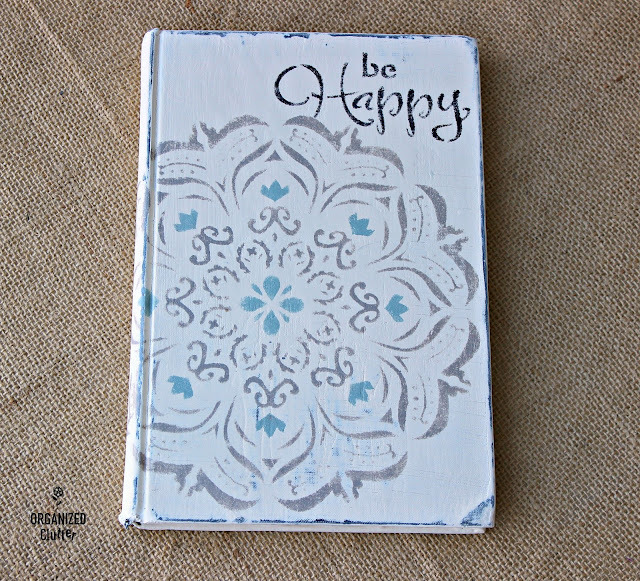 I used "Be Happy" from this Deco Art Americana Decor Stencil Inspiration Words for the title of my smaller book. Both books were sealed with Minwax Paste Finishing Wax in Natural using a wax brush. My up-cycled thrift shop books! 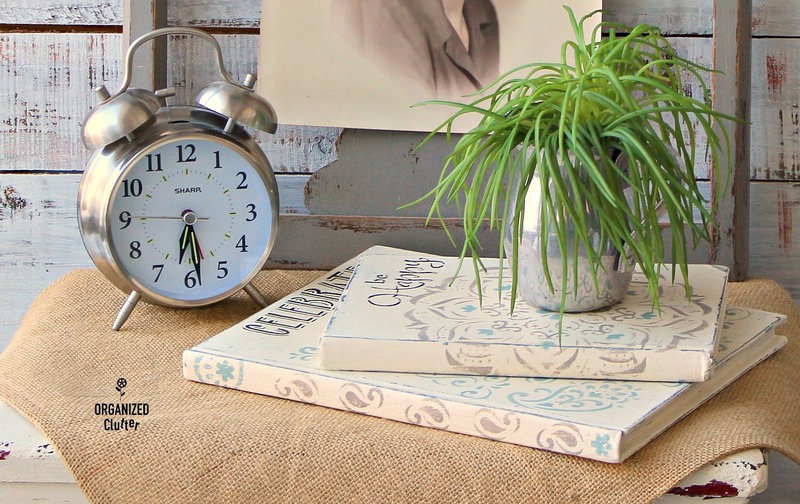 These books are TOTALLY decorative. Painting all four sides sealed the pages shut. I decorate with non up-cycled books all the time! 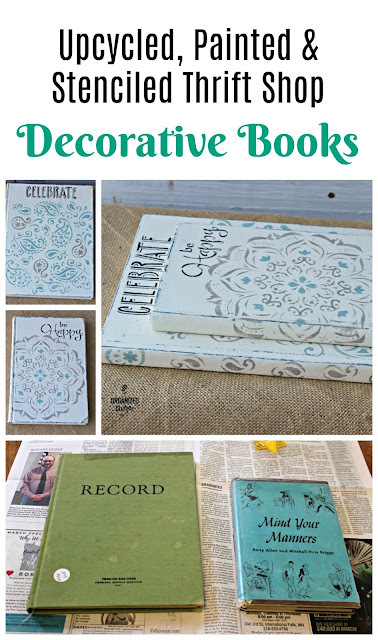 It's fun to up-cycle some inexpensive books JUST as decor! The chairback photo frame post tutorial is HERE. Love how your books turned out! I've been painting on books for years. I usually paint snowmen on mine though. I'm painting a few right now with campers and old trucks. Great way to recycle them. 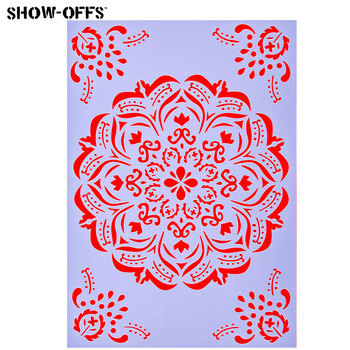 My Hobby Lobby has a lot of their stencils on clearance for .75, $1.00, $1.50. 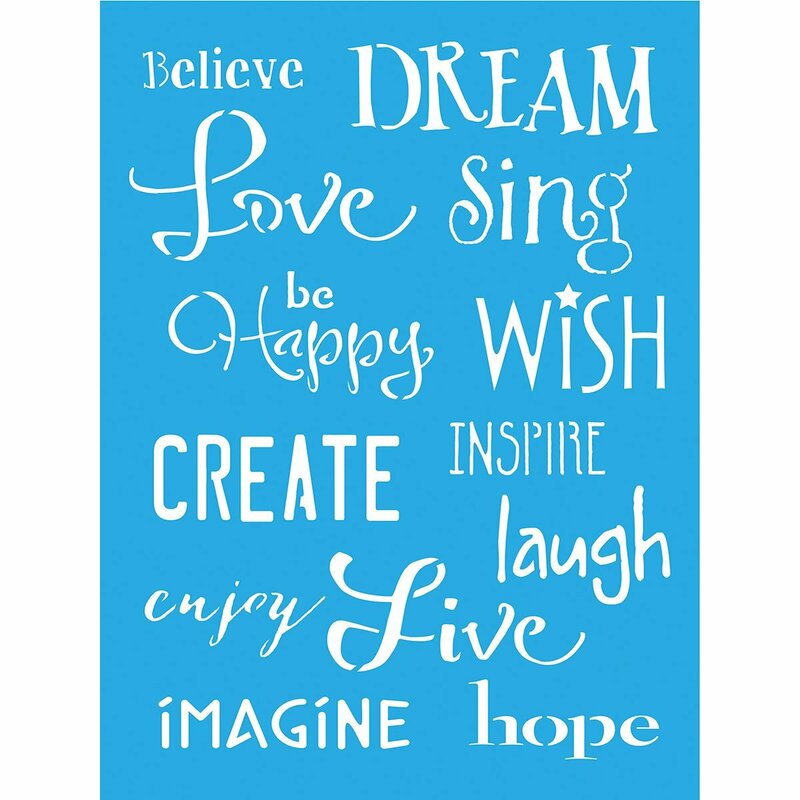 I picked up a 8x10 of a cow for .75, single words like Family, Love, Laugh were also .75 many design pattern were $1.00 just in case you want to check out your Hobby Lobby for more stencils, lol! I can't seem to come up with decorating ideas. Guess I'm getting to old and my brain doesn't want to think LOL. You always do such creative things with you finds. Thanks for a great start to my Sunday. Love em...what is a wax brush? Thanks everyone! These books were very fun to make!